No thanks, leave it blank Yes please - sign it! Your message will be hand-written inside the book by the author! Click the 'buy now' button to go to PayPal for payment. You can change quantities on the next screen. PLEASE NOTE: the quantity will be 1 for each two books for £8.99 offer, but you will receive 2 books. Princess is not a normal toad. Unlike most toads, she has a name. And unlike most toads, she loves to explore. 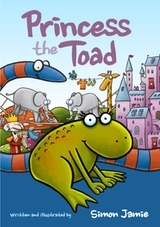 When Princess meets Jim the Snake she ends up on a very unusual adventure. Where have the King's missing socks gone to? Princess is not a princess, she's a toad. I know that might be confusing, but it'll make sense when you read the story. Or it might not, it's impossible to tell. All that we know is that Princess goes on an amazing (and unusual) adventure to find the King's socks. Accompanied by a very friendly but not particularly lucky snake, she finds that the socks are being used for something quite unexpected, by some very unexpected characters. Find out what happens when Chicken decides to go to Fox's house for a nice cup of tea and a slice of cake. Can Parka Penguin save the village of Pickington from Derek the Disgustingly Dirty Dragon? NEW! Follow a boy's adventure as he meets a Zill and hops on Zack to rescue the Booos from the Grand Pumplemoose. It's just as mad as it sounds.